Despite the flames and smoke, some people have remained in Fort McMurray, even after a mandatory city-wide evacuation was ordered. Late on Thursday, RCMP found a family of five, including three young children, during door to door searches of the Dickinsfield neighbourhood. RCMP said the family did not comply because "they did not believe they were in danger." Neighbourhoods and areas of the city frequented by homeless people are also being patrolled. "People need to understand that evacuation orders are issued for a reason, and that not leaving puts them and emergency responders at unnecessary risk," said RCMP Insp. Gibson Glavin. RCMP also said that on Friday a man was arrested after a break-in, the only report of that type they have received. An RCMP news conference was expected at 7 p.m. MT but was cancelled. An update is expected for the morning. The Alberta government will provide $100 million in emergency funding to 80,000 people who were displaced this week by the Fort McMurray wildfire, Premier Rachel Notley says. Notley said her cabinet has authorized payments of $1,250 for each adult and $500 for each dependant, with details about how the money will be paid out expected early next week. "One of the key issues facing people displaced by this disaster is immediate challenges, food and shelter," Notley said. "We hope to deliver these funds to you in the coming days, by Wednesday next week." Notley made the announcement Friday at a news conference in Edmonton. 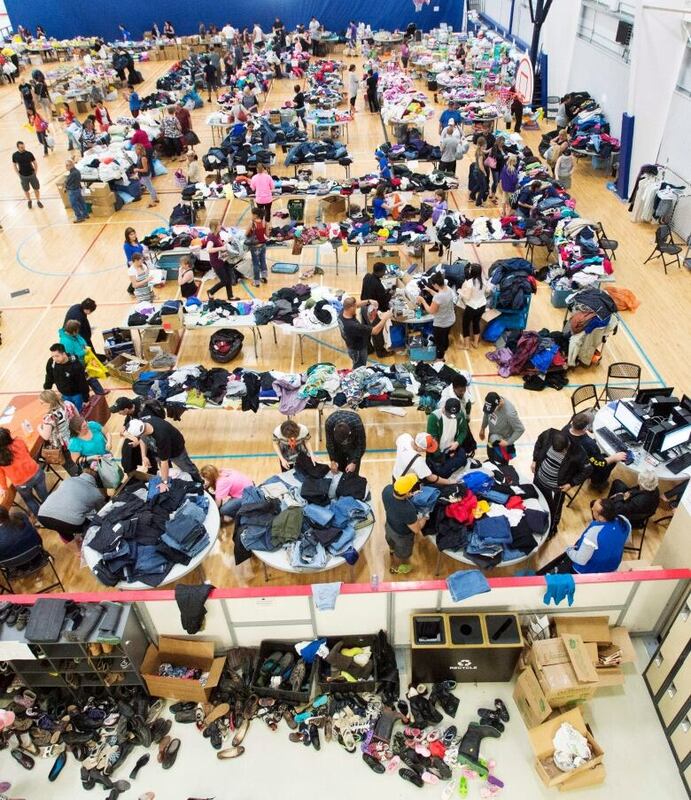 While the premier had good news for evacuees in dire need of some, she had bad news as well. "I want to repeat a very important thing I said last night," Notley said. "The city of Fort McMurray is not safe to return to and this will be true for a significant period of time." 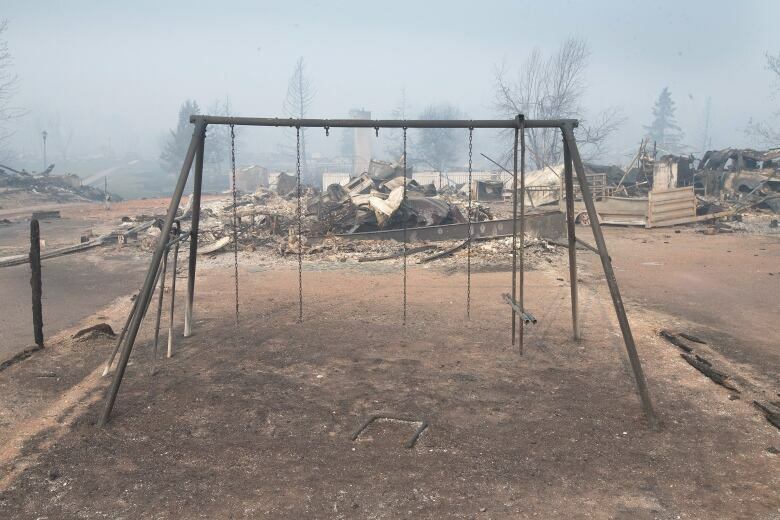 The fire has destroyed more than 1,600 homes and buildings and burned more than 101,000 hectares of forest continues to grow as winds push the flames to the northeast. With the temperature expected to hit 27 C Saturday, the fire could double in size by the end of the day, said Chad Morrison, senior wildfire manager for the province. Because terrain throughout Alberta remains dry, authorities issued a province-wide restriction on recreational use of off-highway vehicles on public lands and provincial parks. The restriction does not apply to agricultural, public safety, commercial, industrial or indigenous users. The restriction applies to all-terrain vehicles, four-wheel vehicles, motorcycles and related two-wheel vehicles and amphibious machines. Could wildfire have been slowed? At an earlier news conference fire officials answered reporters' questions about what might have been done to slow or stop the wildfire. After a wildfire destroyed about one-third of the town of Slave Lake in May 2011, the province commissioned a study to make recommendations for ways to prevent similar disasters. The committee made 21 such recommendations, but in its final report concluded there was little that could have been done to save the town, which suffered what was at time the second-costliest disaster in Canadian history, with an estimated $742 million in insurance claims. "We responded to all 21 recommendations," Morrison said. "Really, our experiences in Slave Lake taught us many things and helped us respond very rapidly and effectively here." But when asked why a firebreak wasn't built around Fort McMurray to prevent a repeat of what happened in Slave Lake, Morrison offered a blunt assessment. "I want to be clear," he said at the same news conference where Notley spoke. "With the nature of this fire and the dangerous conditions we have, no size of firebreak would hold this fire from doing anything. 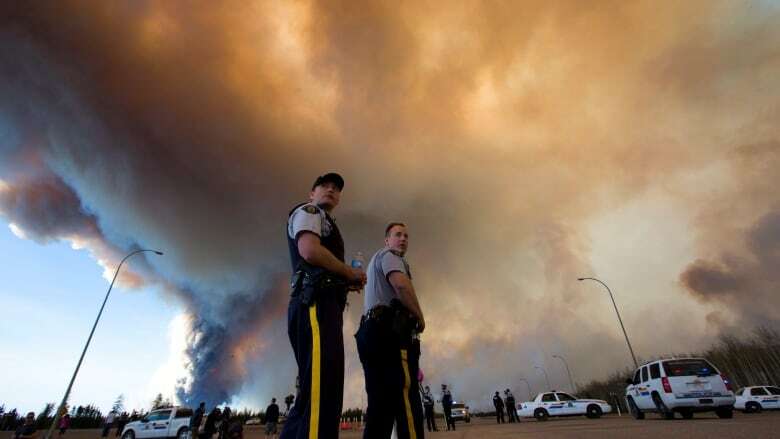 This fire jumped the Athabasca River, which is over a kilometre wide." Morrison cautioned people not to compare the two fires. Slave Lake was a "wind-driven" wildfire that closed in on the town at great speed, pushed by gusts of up to 100 km/h, he said. This week's Fort McMurray wildfire is "fuel-driven" and grew so quickly because of tinder-dry conditions in an area of the province that hasn't seen any significant rain this spring. The Regional Municipality of Wood Buffalo has an active and effective fire-prevention program in place, Morrison said. But he stressed that no amount of preparedness and no protection measures would have saved Fort McMurray from the flames. "This fire is jumping kilometres at a time. We're seeing fire spreads where it's creating its own lightning fires out of this fire. This is an extreme, rare, rare fire event. And that's something that's historic for us." Morrison said wildfires that grow and move quickly are almost impossible to stop once they get rolling. "These are dangerous, dangerous fires," he said. "Unpredictable. Mother Nature is going to move these fires on us, and we can only do as first-responders what you can do. And that is get people out of the way and try to protect as much of the community as we can." Morrison said the priority for firefighters will be to try to protect homes and buildings. "We did hold the line yesterday in many places [in Fort McMurray]," he said. "We continued to establish dozer guards in the Parsons Creek area, and firefighters worked in the Timberlea, Thickwood and downtown areas to continue to secure that." Notley said fire suppression efforts in the city itself have paid dividends. "As of this morning, the downtown is largely intact," the premier said. "The hospital is still standing, the telephone centre is intact, the water-treatment centre is back up and running. Municipal buildings and the airport also remain intact." 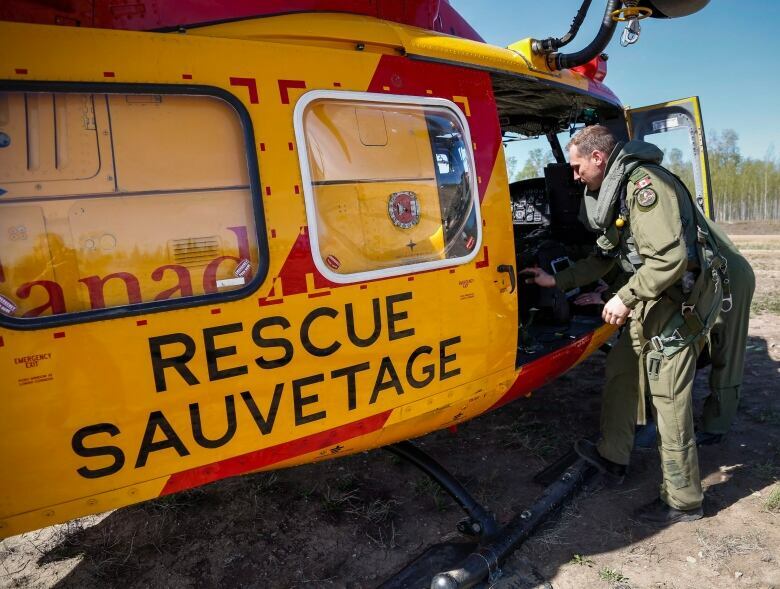 The fire burned past the community of Anzac, where up to 18 to 20 buildings were reported lost, and by Friday afternoon remained about five kilometres from Gregoire Lake, said Morrison. The wind on Friday is expected to push the fire to the northwest, away from the city and smaller communities. A big challenge for the province will be to find temporary housing for the 80,000 people who will not likely be able to return to Fort McMurray for weeks. The premier said 14,000 displaced households have already registered with the Red Cross, and she urged the rest of the city's population to follow suit as soon as possible.